When he crossed the finish line at the Marine Corps Marathon Oct. 31 with a time of 2:24:08, 1st Lt. Sean Barrett got a good old hand slap from Gen. Jim Amos, the new commandant of the Marine Corps. 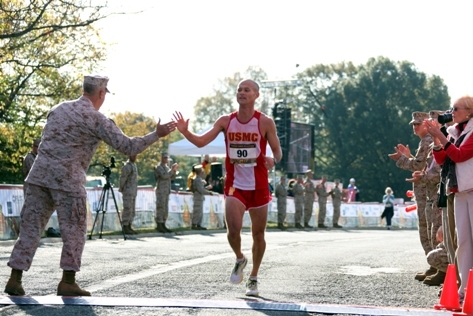 Gen. Jim Amos and 1st Lt. Sean Barrett slap hands at the finish line of this year's Marine Corps Marathon. Barrett was the first Marine to finish the 35th annual race, trailing top winner Air Force 2nd Lt. Jacob Bradosky by about a minute. Bradosky won the marathon with a time of 2:23:30.